[시사뷰타임즈] 세계에서 가장 크고 쌍둥이 엔진을 가진 젯 여객기가 우리 옆에 있다. 보잉사는 앞으로 다가올 보잉 777X-9 여객기를 잠시 볼 기회를 제공해주었는데 보잉사가 차후 내놓을 777s 세대의 것 중 최초의 작품이다. “조립을 완전히 마친” 정지 시험 비행기가 이달 초 워싱튼 에버렛에 있는 보잉사 제작 시설에서 선을 보였다. 이 비행기는 하늘로 날아갈 일은 없을 것이지만, 거의 1년 동안 구조적 힘과 설계의 정밀도를 확인하기 위해 지상에서 실험을 해오고 있는 중이다. 기체가 대체적으로 완공되긴 했지만, 이 실험용 비행기는 엔진 및 항공전자기기 등과 같은 것은 없다. 보잉 777X 실험평가 프로그램관리자인 도린 빙고는 “정시 실험은 설계된 구조를 확인해보고 하중을 견디게 해줄 요소들을 실험할 수 있는 기회이며 우리의 고객들과 공개적 비행에서 최종적으로 안전한 제품이 확실히 될 수 있도록 하는 것”이라고 했다. 일단 이 비행기가 모두 완성되면, 777X-9는 보잉사의 99년 역사상 가장 넓은 날개폭을 갖게 되는데, 235피트 5인치(706cm)가 된다. 이 비행기의 경첩이 달린 날개 끝의 길이만도 360cm이며 이것에는 비행하는 동안 접히는 걸 막기 위해 고정핀이 사용된다. 이 비행기는 앞서의 정지 실험에서 지정된 하중의 1.5배를 싣는 실험을 해왔는데 그 결과 720cm 이상 접을 수 있게 됐다. 이 비행기는 350명~425명까지 태울 수 있으며 2020년 첫 취항을 하기로 돼있는데 처녀 비행은 내년부터 시작한다. 이 비행기는 한 번 주유로 15,000km를 날아갈 것으로 예상되는데 거리로 치면 패너머 운하에서 두바이까지의 거리다. 에머럿(에미레이트), 올 니뽄 항공사 및 루프탄자 등의 몇 몇 항공사가 이미 주문을 해놓았다. (CNN) — The world's biggest twin-engine jetliner is almost here. 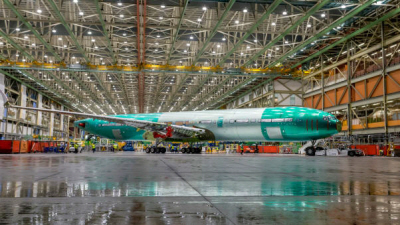 Boeing has finally provided a glimpse of the upcoming 777X-9 aircraft, the first aircraft of its next generation 777s. The "fully assembled" static test plane was rolled out at the Boeing facility in Everett, Washington, earlier this month. While it will never take to the skies, the aircraft is to undergo almost a year of testing on the ground to verify the structural strength and accuracy of the design. "Static test is our opportunity to verify the design of the structure and load bearing components of the airplane, ensuring the final product is safe for our customers and the flying public," says Doreen Bingo, Boeing Test and Evaluation 777X Test Program manager. Once completed, the 777X-9 is to have the widest wingspan of any aircraft in the company's 99-year history: 235 feet, five inches. The wings give the airliner extra lift, similar to that of a giant sailplane glider, helping the plane to save an overall 12% more fuel than the Airbus A350, according to Boeing. They've been tested at one-and-a-half-times the designated load during previous static tests, resulting in a wing flexing more than 26 feet.